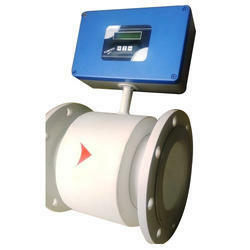 Prominent & Leading Manufacturer from Vadodara, we offer flow meter, sanitary electromagnetic flow meter, etp water flow meter, electromagnetic flow meter (magflow meter), flow measuring instruments and mag flow meter with rs485 (modbus). Flowtech make electromagnetic flow meter are intended for measuring flow of electrically conductive liquids in closed pipe lines where the magnetic flux permeates the entire cross sectional area of the liquids flow. Electromagnetic flow meters measure electromotive forces to determine liquids velocity using faraday’s law of electromagnetic induction and compute the flow rate using equation of conductive liquids having minimum conductivity of 5 micro siemens / cm and are relatively immune to the effects of temperature , pressure , viscosity & density of the flowing liquid. Cable length for remote : 10 meters. Accuracy : ± 1% FSD Optional: ±0.5% FSD. 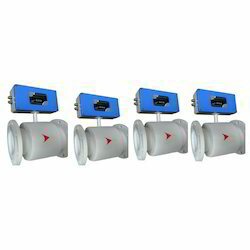 FLOWTECH Make Mag Flow Meter / Flowmeters with RS485 (MODBUS) are intended for measuring flow of electrically conductive liquids in closed pipe lines where the magnetic flux permeates the entire cross sectional area of the liquids flow. Electromagnetic flow meters measure electromotive forces to determine liquids velocity using Faraday’s law of electromagnetic induction and compute the flow rate using equation of conductive liquids having minimum conductivity of 5 micro Siemens / cm and are relatively immune to the effects of temperature , pressure , viscosity density of the flowing liquid. Installation : Inline Flange Type. 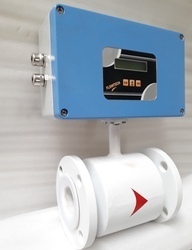 FLOWTECH Make Magnetic Flow meter for liquid with RS 485 & Pulse Output flow meter are intended for measuring flow of electrically conductive liquids in closed pipe lines where the magnetic flux permeates the entire cross sectional area of the liquids flow. Electromagnetic flow meters measure electromotive forces to determine liquids velocity using Faraday’s law of electromagnetic induction and compute the flow rate using equation of conductive liquids having minimum conductivity of 5 micro Siemens / cm and are relatively immune to the effects of temperature , pressure , viscosity density of the flowing liquid. Accuracy +- 1% FSD Optional: +-0.5% FSD. 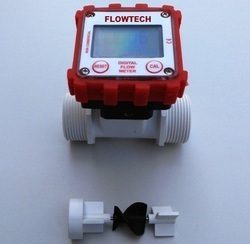 FLOWTECH Make Water Magnetic Flow Meter are intended for measuring flow of electrically conductive liquids in closed pipe lines where the magnetic flux permeates the entire cross sectional area of the liquids flow. Electromagnetic flow meters measure electromotive forces to determine liquids velocity using Faraday’s law of electromagnetic induction and compute the flow rate using equation of conductive liquids having minimum conductivity of 5 micro Siemens / cm and are relatively immune to the effects of temperature , pressure , viscosity & density of the flowing liquid. FLOWTECH Make developed and produced helical rotor flow sensor specially for Liquid dispensing industries, now a day water dispensing industries use plastic turbine flow sensor its k factor change with flow rate so for solution we developer helical rotor plastic flow sensor with same pulse k factor for full range also provide very good accuracy and repeatability in full range of measurement,Helical flow meters are positive displacement meters with a very favorable low pressure drop behavior. therefore perfectly suited for the flow measurement of very high viscosity fluids.Due to wide measuring ranges, high accuracy and resolution helical flow meters are an excellent choice for laminating systems, painting systems, adhesive dispense systems, as well as batching systems for various fluids. 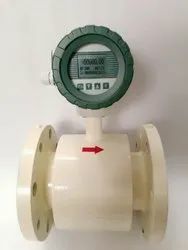 FLOWTECH Make PTFE liner digital waste water flow meter are intended for measuring flow of electrically conductive liquids in closed pipe lines where the magnetic flux permeates the entire cross sectional area of the liquids flow. Electromagnetic flow meters measure electromotive forces to determine liquids velocity using Faraday’s law of electromagnetic induction and compute the flow rate using equation of conductive liquids having minimum conductivity of 5 micro Siemens / cm and are relatively immune to the effects of temperature , pressure , viscosity density of the flowing liquid. FLOWTECH Make Effluent Treatment Plant Equipment are intended for measuring flow of electrically conductive liquids in closed pipe lines where the magnetic flux permeates the entire cross sectional area of the liquids flow. Electromagnetic flow meters measure electromotive forces to determine liquids velocity using Faraday's law of electromagnetic induction and compute the flow rate using equation of conductive liquids having minimum conductivity of 5 micro Siemens / cm and are relatively immune to the effects of temperature , pressure , viscosity & density of the flowing liquid. 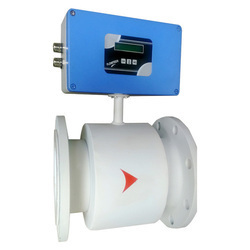 FLOWTECH Make Mag flow meter with 4-20mA output and digital display are intended for measuring flow of electrically conductive liquids in closed pipe lines where the magnetic flux permeates the entire cross sectional area of the liquids flow. Electromagnetic flow meters measure electromotive forces to determine liquids velocity using Faraday’s law of electromagnetic induction and compute the flow rate using equation of conductive liquids having minimum conductivity of 5 micro Siemens / cm and are relatively immune to the effects of temperature , pressure , viscosity density of the flowing liquid. Accuracy +-1% FSD Optional: +-0.5% FSD. 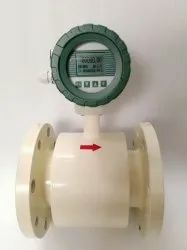 Flowtech Make STP Water Meter Are Intended For Measuring Flow Of Electrically Conductive Liquids In Closed Pipe Lines Where The Magnetic Flux Permeates The Entire Cross Sectional Area Of The Liquids Flow. Electromagnetic Flow Meters Measure Electromotive Forces To Determine Liquids Velocity Using Faraday’s Law Of Electromagnetic Induction And Compute The Flow Rate Using Equation Of Conductive Liquids Having Minimum Conductivity Of 5 Micro Siemens / Cm And Are Relatively Immune To The Effects Of Temperature , Pressure , Viscosity & Density Of The Flowing Liquid. Liquid Chamber End Fitting P.P / C.S. / S.S.304 / S.S.316 / MS with PP or Teflon Lined. FLOWTECH Battery Operator Electromagnetic flow meter operation principle is based on measuring electromotive force induced in electrically conductive liquid when it moves in magnetic field. 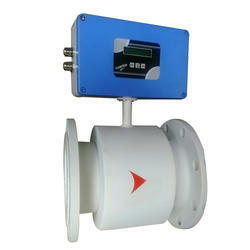 The magnetic field is furnished in the flow sensor's inner channel by a special electromagnetic system. Inductive electromotive force (EMP) E is proportional to the mean flow velocity v, distance between the electrodes d (which is equal to the sensor's inner diameter), and magnetic field strength E = v ×d×B×k. Electrode: stainless steel, titanium, tantalum, etc. 4-20 mA analog output; Pulse outputs , RS-485 interface , HIGH & Low alarm output. Packaging Details: Wooden Cage & Plywood Box, As per party require.